Having a sick baby is never fun. For new parents, it is scary when you don’t know if it is the common cold or something more serious. Did you know that it is common for babies to catch a cold 7-12 times a year?! Everything is perfect, and suddenly the baby has a cold, and you feel powerless. Some symptoms of a cold is a fever, cough, sneezing, red eyes, runny nose, restlessness, nasal congestion and difficulty going to sleep. If your little one is not finding any relief after 24 hours, it is best to see a doctor. However, today we will explore some proven by time cold remedies to keep kids healthy, build their immune system or help to nature them back to health. A great way to relieve some pressure for nasal blockage for your baby is to give them a gentle massage. By rubbing your fingers on top of their nose where their eyes meet and then slowly work your fingers down the nose and then over the nostrils. This will not only help with the pressure but hopefully squeeze out any goo that has been stuck up in there. 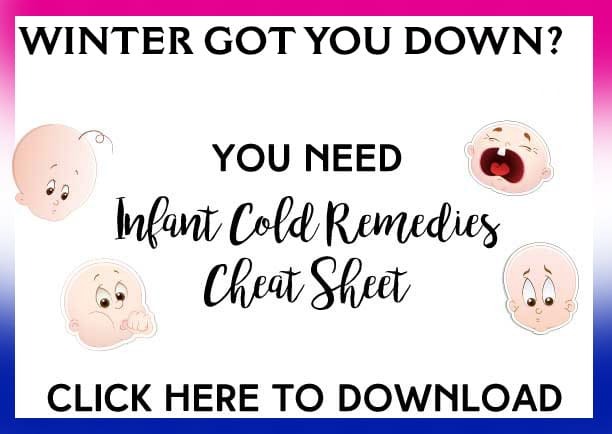 This is easy to make especially if your baby has a cold and you are looking for a quick solution! All you need is a 1/4th cup of coconut oil and six peeled garlic cloves. Put all the ingredients into a food processor and keep processing until it’s smooth. Store in a glass jar and keep it in the fridge for up to 6 months. When you need to use it, rub it on their feet and their chest. Goot is a great homemade remedy! Not only does it help with cold’s symptoms, but it kills bacteria and viruses and helps boost their immunity! If you are breastfeeding, breastfeed them as much as possible. When your baby has a cold, it helps keep them hydrated. When a baby is very congested, they may not breathe too well when feeding and get tired quickly before they empty your breast. So keep offering it to them as often as you can. Breastmilk has tons of antibodies that also help cure their cold. Did you know that you can also put breastmilk in their nose or eyes? It’s fantastic to help clear up an infection! When they are sleeping be sure to put a humidifier on in their room. The steamy air will help clear out their nasal congestion. In the winter, when the air is a bit more dry, putting moisture in the air will help thin the mucus, therefore, easing the congestion. If you don’t have a humidifier, hang wet sheet or clothes in the room to help to add moisture into the air. When a baby is very congested, it’s hard to get all the mucus out of his nose. The nasal suction helps clear them out. When using one, choose one with a rubber or silicon tips and make sure that does not go all the way in their nose. NoseFrida is perfect for this task! If you have never used essential oils before, it may be something worth looking into if your baby has a cold. Essential oils that are good to diffuse to help with congestion are cedarwood, clove, eucalyptus, ginger, lemon, melaleuca, peppermint, rosemary, sandalwood and thyme. You can also add lavender to help your little one relax. Remember to never use these oils directly on your baby’s skin. You can put these essential oils in a room diffuser. If you have a favorite essential oil company, check out their autoimmune and germ-fighting blends. I buy my essential oils from the Plant Therapy but know that doTerra and Young Living have amazing oils and blends. For winter congestions and colds I like Respir Aid by Plant Therapy, which has these equivalents: RC by Young Living and Breathe® by doTerra. Another blend to consider is Germ Fighter by Plant Therapy, Thieves® by Young Living, and On Guard® by doTerra. If your baby has a bad cold, the soft tissue in his throat might be swollen. To relieve this, take your baby outside into the cold air. Wrap him up, so he is bundled well – the cold air will reduce the swelling and ease your baby’s congestion. If a cough does not get better, you may need to bring your little one to see a doctor so they may give them breathing treatments to help. Not only does the warm moist air help with their breathing but it can also help their fever if they have one. For even more help, climb in with a baby and keep the skin to skin. When you have skin to skin contact, they can regulate normal body temperature. Home Remedy for Cough in Children: Onions in Socks? Another way to bring down a fever is to use onions. This may seem silly at first, but it works when baby has a cold! Cut large slices of onions and put them in their socks (use older sibling socks if it is hard to fit the onions). When the onion turns brown, the fever should be down. Your baby may have smelly feet, but they won’t have a temperature! When your baby is sleeping, or nursing try to keep him upright. When they are upright, the mucus can drain down. So hold that baby close to your chest when they fall asleep and be prepared to catch up on your Netflix! Vinegar has some heat attracting qualities and often works better than Tylenol (yet it shouldn’t replace it). When the fever spikes, I used to sock baby sock in the vinegar and put it on their feet or put a vinegar compress on their forehead. Make sure that vinegar doesn’t come in contact with eyes and mouth, and I wouldn’t leave a baby alone with this compress on. I also remember my parents used a sponge to give my sister a vinegar sponge bath. And now to some questions that I know, I was looking answers for when my kids were babies. 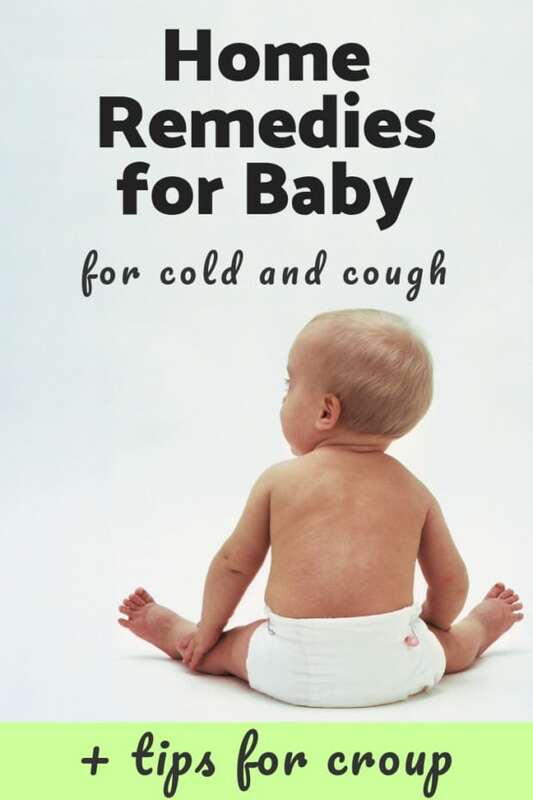 How to help baby with a cough? Try keeping your baby comfortable. Unfortunately, kids at this age don’t understand much about what is happening to them but they often get their fussy frustration with you. How you can help a baby with a cough? You can prop them in the crib with their head slightly elevated. 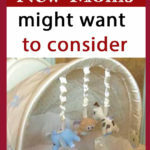 During this time your baby will be more comfortable in a cradle swing or a car seat. If mucus is present, use nose aspirator to clean nose and mouth, but make sure the asparator has a soft tip. Keep baby in a quiet room. 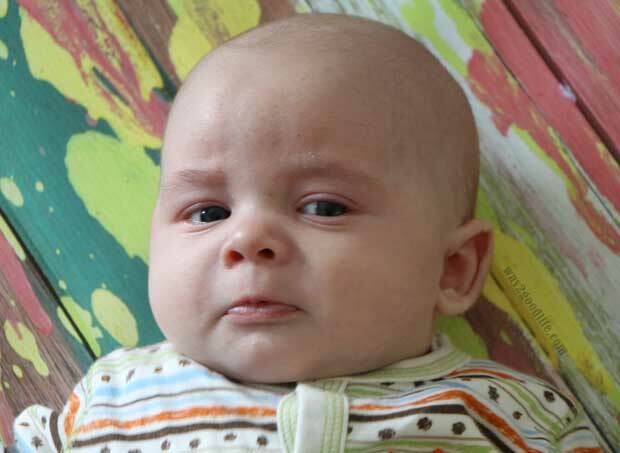 Babies don’t sleep well while fighting cough which makes them espcially cranky. Let them catch up on sleep during the day. They might be nicer to you. If a baby produces barky cough, read below about croup. Mucus is no joke and congested baby is a cranky baby. 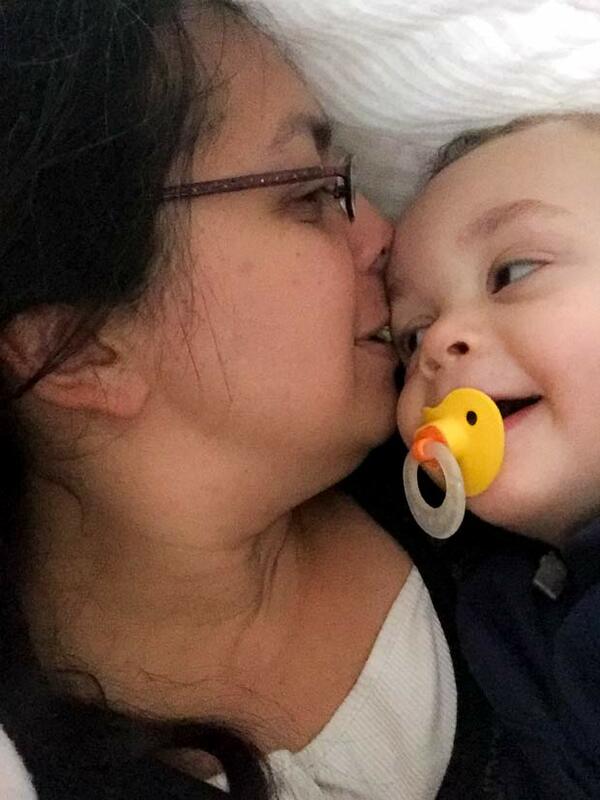 I remember standing in my son’s room on the middle of the night afraid to leave and thinking of every possible scenario of what might happen the minute I close my eyes. How can you help congested baby? Invest into a warm mist humidifier and keep it on. Hot and humid is a perfect and nearly a tropical environment will help to thin out mucus. Consuming any kinds of liquids (breast milk or water) will also help to break down mucus and will speed up the healing process. And remember to breastfeed as often as possible – breast milk is great at building an immune system. It often starts on the middle of the night. You wake up to your baby crying yet it sounds like somebody else is in th room. A stranger has a rusty voice and he sounds cranky. You will find your baby crying scared and confused. You will be scared and confused because nobody ever told you of baby croup. Baby croup is scary and most of the parents forced to go to the emergency room at least once before they learn how to deal with it. What does croup sounds like? Croup’s most common sign is a barky cough. However, that often comes with fever, hoarseness, and labored or noisy breathing. Bad news once your child has croup, this barky cough will most likely happen again (it did for each of my kids). Good news: your baby will overgrow it by the age of five. How does Croup happen? Tissue inside of your child’s trachea get swollen and pushes against the airways. Next thing you know, you have a child making all kinds of scray noises inluding barky cough. The key to avoiding a trip to the the emergency room is by being proactive. At a earliest sign of fever or barky cough, start warm mist humidifier. Warm water and air will create a hot and humid environment – perfect for softening a barky rough caugh. Put my essential oil diffuser to a good use with a germ fighting blend. Respir Aid by Plant Therapy is my favorite blend when the croup strikes (look for RC by Young Living and Breathe® by doTerra).My second choice is Germ Fighter by Plant Therapy (Thieves® by Young Living, and On Guard® by doTerra). I love detox bath for my kids. I wouldn’t give it to a newborn but I used to give it my babies when they were about nine months. Fill a bath with water to a comfortable level, ¼ cup of each of apple venegar, hydrogen peroxide, and epson salt. Let them play in the water for about thirty minutes. Every mom wants to know how long does croup last? Every time my kids had it, it would take around five days for the barky croup cough to go away. It also usually gets worse at night. Cough might continue for a couple of weeks. I hope these little nuggets will help your little one battle with coughs and sneezes of your little ones. I have never heard of “goot” before. Is the recipe the same for older kids? Our babies aren’t so little anymore. I am trying to think, but I am pretty sure neither of my boys had colds when they were infants. Thank god. There is nothing worse than colds in little ones. 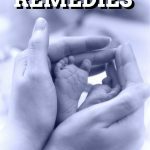 These are all really great remedies! Great tips here for helping your baby get better. It’s hard when they are sick. These are such great ideas! I was always so worried when my kids got sick when they were babies and hated to give them medicine. I wish I had known about these home remedies then! There’s a few of those tips I’ve never heard of – like putting onions in socks. I suppose if it works, it’s worth it. Baby’s need to get better quick!! You know what I love most about all your ideas? That none of them require medication that could contain harmful ingredients. I’ve always preferred to treat my kids as naturally possible when they are sick and good for you for doing the same! It’s so hard to see your baby suffering from a cold. Having relief on hand is a good idea. There’s nothing more pitiful than a baby with a cold. I always feel so sorry for them. Hopefully people will follow your advice and help prevent colds in their babies. I’ve never heard of the onion trick. I wonder why that is!! Cool! Great ideas. You can also put Vicks on your chest so when the baby nurses helps open up their sinus cavity too. This is a great list! I never heard of the onion trick either but these will definitely come in handy! These re great natural tips. I always try the natural route first. The Onions in Socks is a method I have never heard of. I just might have to try it next time. Thanks for the tips.